2 de Mayo means 2nd of May. 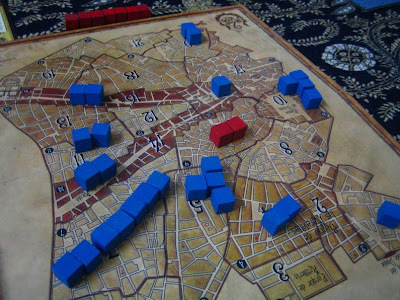 The game refers to events that took place on 2 May 1808 in French-occupied Spanish capital Madrid, when local citizens revolted against the French army, the strongest army in Europe at the time. This is a very asymmetric game. 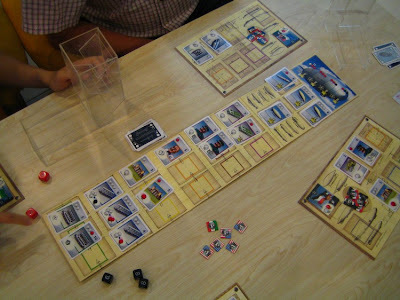 It is a short game with simple rules, but it also has a lot of theme. It feels very different playing the two sides of the conflict. The French are much greater in numbers in this game. To win, they need to kill off all Spanish units, and secure all 4 entry points to the city, by the end of Round 10. The Spanish win if they can prevent this. They can also score an instant win if they kill 4 French units. At the start of a round, players each draw an event card from their respective decks. These cards can be played any time. You just follow instructions on them. Most are useful to you, but some are a hindrance, or benefit your opponent. There are 11 cards per side, and 10 rounds in a game, which means only 1 card will not be drawn. So knowing the cards well will help you. E.g. 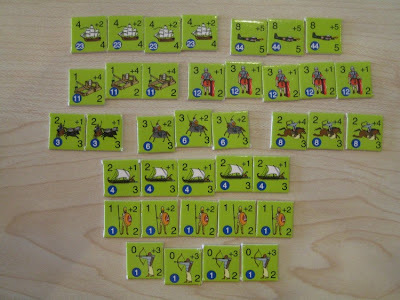 there are a pair of Spanish cards which allow a Spanish instant win by killing only 3 French units. Also there is one French card which cancels one Spanish move order in Round 10. 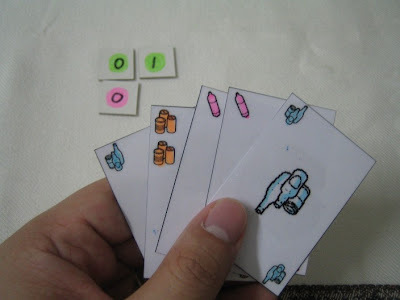 After drawing cards, players secretly write down their move orders for the round. The two side have different rules when moving. The French can only make two orders, except for groups starting in 3 specific areas (main streets of Madrid). Also French units cannot leave an area where fighting is taking place. However, the French can split their groups when moving, unlike the Spanish, whose units must move together once they have met up. The Spanish units can break away from fights though, but they must leave behind half the units to continue the fight (well, I guess more often than not to die holding off the French so that the rest can escape). The Spanish does not have limitations on how many orders they can issue. Move orders are revealed simultaneously. Then the Spanish move, before the French do. Once movement is done, fighting (where units from both sides coexist in the same area) is resolved. The side with more units kill one unit of the losing side. If you outnumber your opponent by twice the number of units, you kill 2 enemy units. If your numbers are triple that of your opponents, you kill 3, and so on. If both sides are equally matched, noone gets killed. So the game is very straight-forward: draw card, write and reveal orders, move, fight. What amazes me is how flavourful the game feels. Michelle (as the French) and I (as the Spanish) played the game without reading any of the cards beforehand (intentionally). The cards add a lot of flavour to the game because they introduce exceptions to the game, making the two sides very different. The movement rules themselves already make the two sides quite different. The game reminds me a little of Lord of the Rings: The Confrontation, because of how asymmetric the two sides are. But of course the gameplay is completely different. In our game, I started off trying to kill the lone French unit in area 10. The game starts with one French unit in area 10 already engaged in fighting, which means it can't leave, and is a sitting duck because it is surrounded. Unfortunately Michelle played an event card that prevented any French in area 10 from getting killed. What luck. I tried to score an instant win by killing off four French units. 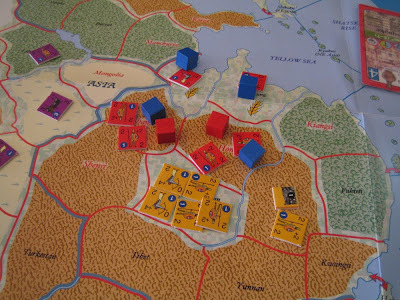 At the start of the game most of the French units were outside the city, and those inside were quite scattered. So if I wanted to do this I'd have to do it quickly. Michelle played another event card that effectively sealed off the southern part of the city from me (because she controlled areas 15 and 16 - one of the main streets). Her reinforcements marched into the city slowly but steadily. I was getting my hand full of useless cards. Holding useless cards is worse than not having cards, because if you hold 3 cards (or more) more than your opponent, your opponent can stop you from drawing cards. There were a few rounds that I couldn't draw cards. I tried to mass my units to fight some of the smaller French groups. I was only able to kill two units before my group was surrounded. It was a lost cause, so my next option was to try to survive until Round 10. I played one event card that allowed my remaining two units to skip one fighting round (i.e. no casualty for that group for that round only). The group was already engaged in fighting. I still held one card that allowed me to add +1 strength. I only had one more round to go. I had planned to move one of my two units out of the fight, to a neighbouring area with two French units. Normally that single unit would have been killed, but with the +1 strength card, I would match the French strength, and would not be eliminated. Unfortunately for me, Michelle had two (!) cards that could cancel my move order. So my plan didn't work out. The last two rebel units were defeated by the French army. The game board is quite small. The French are blue, the Spanish red. One big fight. Unfortunately Michelle played an event card that allowed her to add one unit. Thing went downhill from here. These were all my forces, and she had plenty of reinforcements coming. My last two Spanish units trying to run away and survive past Round 10. They were eventually hunted down and executed. I was hoping to get one of them to escape to Area 4, occupied by 2 French units. I had one card which could give me +1 strength, which would have allowed that last unit to last until the end of Round 10. 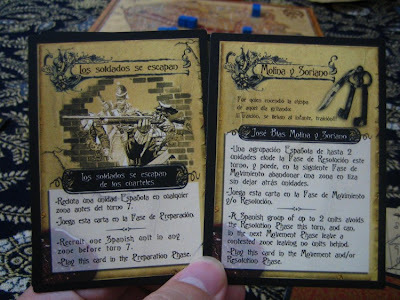 Cards are in both Spanish and English. They are quite flavourful and refer to real events on that fateful day in May. 2 de Mayo is quite an interesting and fun game, despite seemingly so simple. After one game, I'm not so sure yet whether the best strategy for the Spanish is to go for the 4-kill instant win, or to try to last until Round 10; to disperse its forces to try to avoid getting caught, or to group together to fight. The game is mostly open information, the only randomness being introduced by the cards. Since 10 out of 11 cards will come into play in every game, the difference from game to game will mostly be in the order the players get the cards. This can affect the players' strategy a lot though. Another factor of unpredictability is, of course, how your opponent makes his move orders. There is some bluffing and double-guessing in this aspect of the game. Replayability may be a concern, since the main difference from game to game is just the order of the cards appearing. But this may not be a game that you want to play over and over all the time. You probably want to play this 5 - 10 times when you first buy it, and after that only pull it out once in a while. Castellers was one of the games that Chong Sean ordered, when he, Han and I pooled together to order a batch of games from Canada. Since he is in KK, the earliest that he will be able to get his hands on his game is next month, when Han has a business trip to KL, and can bring it to KK for him. I put all his and Han's games in one corner, waiting for Han to pick them up next month. 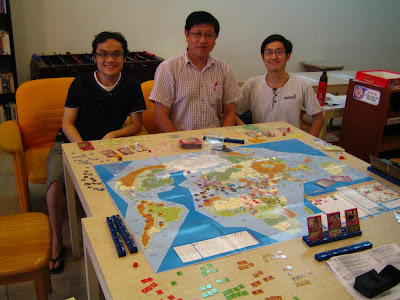 I was surprised (pleasantly) when Chong Sean asked me to open up his games and play them and share with him some photos. To gamers (or maybe it's just me), opening another gamer's game is worse than sacrilege. Opening a new game is a sacred ritual - ripping off the plastic wrap, listening to the first box fart (if any), punching out the cardboard components, bagging them and so on. Only with Chong Sean's blessing, I went ahead to open up Castellers and gave it a go. The theme of Castellers is a traditional sport in Spain, where teams compete to build the tallest human tower. The current world record is 10 levels high, which is quite amazing. 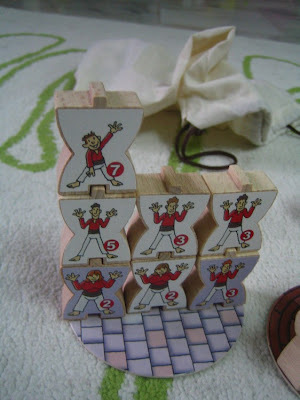 In the game, you build these human towers using nice big wooden blocks. Everyone starts with a hand-size of two blocks. On your turn you have two actions which you can use freely. The three possible actions are: (a) drawing a block from the bag, (b) adding a block to a tower, including building a new tower, and (c) swapping your block(s) with an opponent's single block and immediately adding that single block to your tower. When building a tower, there are only a few rules you need to remember: (a) blocks must be of the some colour, (b) you must complete one level before you start the next - your tower can be of any width, but once you start building on the 2nd level, you have committed to the width for that tower (i.e. the width of Level 1), and (c) a block above another must have a larger number - numbers range from 1 to 7. Not all towers score points for you. For a tower to be "active", it needs at least two complete levels and at least 4 blocks, e.g. a 2-width 2-height tower, or a 1-width 4-height tower. Towers score according to the number of blocks in them, and some blocks give 2pts instead of 1. There are bonuses for widest tower and tallest tower. For each tower that you build, you deduct 1pt. This discourages you from building many useless towers. I have only played one learning game with Michelle. We were both quite conservative about starting towers, and spent many turns drawing blocks and hoping to get good hands before we started building. The game was very quick. I started building earlier, and ended the game before Michelle could do more building. She underestimated how quickly the game could end, and this costed her the game. My four human towers. The blocks with a light purple background score 2pts each. The rest score 1pt. Close-up of the blocks. The block with a white shirt is a joker. 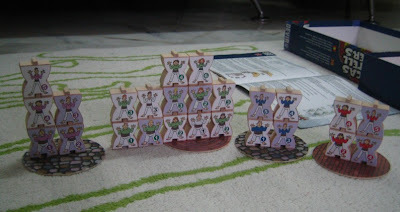 Three of the six types of bases, and the bonus tokens for widest tower and tallest tower. One of Michelle's towers. The cloth bag in the background is used to store the blocks. Close-up of a tower. Unfortunately this one does not score, because its second level is not yet complete. Castellers is a simple and quick game. It is meant for 2-4 players, but I'm not sure how well it works with two. I have a feeling it's not tense enough, because probably both players will try to build in all four, or at least three, of the colours. I think with more players things will be more exciting, because you'll have to watch out for more opponents force-swapping your blocks. There will probably be more tension in choosing the colours to build in too. This is my gut feel. One thing that I didn't like is the production. I think this is clearly a case of physical attractiveness over practicality. The blocks only have stickers on one side, so you need to place your towers at an add angle so that both you and your opponents can easily (read "with bearable trouble") see them. The publisher probably could have provided double the sticker sheets, but peeling and pasting the stickers to the blocks would be double the work. 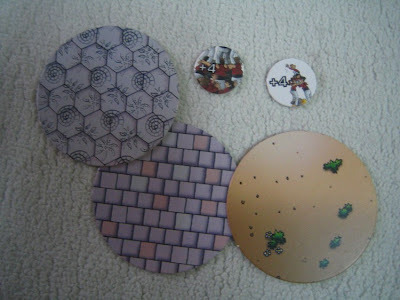 The round bases that come with the game seem unnecessary to me. Also they are not wide enough if I want to build a tower of width 4. I would have preferred the game to be implemented as a card game. But of course it wouldn't look as impressive. A passerby may think this is a Jenga-like game, where the towers are eventually supposed to collapse. They're not. Please don't cheer if you see another group playing this and a tower collapses. This is a topic I have been wanting to write about for quite some time, but never quite got around to it, because it's a heavy topic that makes me think a lot. I'd have to really sit down to think about it from various angles, and to organise my thoughts, before posting this blog post. 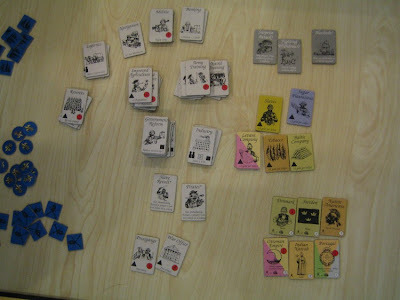 Of course, the main reason I want to write about it is because I do this - I self make games which are designed by other people (here's a link to when I last wrote about this), and I play these self-made copies. Is this right or wrong? Self-made R-Eco. It's quite a clever and quick game with a unique twist. I quite like it. But somehow I don't play it a lot. Probably because it's a short game. First, there are different ways to define what's right and what's wrong. Legally right and morally right are different. The latter will probably have different interpretations, depending on your background, your culture, your world view. Let's start from the legal viewpoint. If I'm making a copy to play with my own friends, and not making a business profit out of it, I think this is not against any law. If I don't freely (as in "without care", not "free of charge") share the tools, equipment and techniques that I use for making a home-made game, I think I'm not breaking any law. Based on my limited understanding, the line is crossed only if you are making a profit out of it. I have read on BoardGameGeek a discussion about a version of Bang released commercially in China. The Chinese version has a Romance of the Three Kingdoms theme, and is much richer than the original Bang, with more characters, more powers, weapons, etc. However, from reading the description (I have not played either game), it seems very obvious to me the Chinese version (I forget the name) is obviously based on Bang. And the designer of Bang was never credited, and never received any royalty or fee. To me, this is wrong. But there are some who think differently. I have read that only game rules and artwork are copyrighted, as written / drawn. If you use the same game concepts, or use rewritten rules, it's not illegal, as long as you don't copy the text straight and don't re-use artwork. If so, I guess this Chinese version is not illegal, but I'd say it's wrong, from a moral perspective. Well, this is one extreme - plagiarism (in my opinion). And it's for commercial use. Try-before-buy: You are not sure whether you'll like the game. You don't have easy access to try it, e.g. a friend's copy, or a shop's demo copy. So you make your own copy and see whether you like the game. For me, I find that more often than not I don't end up buying a copy of the real game. Usually that's because I found that I didn't like the game as much as I had thought I would (e.g. Medici & Strozzi, Felix: the cat in the sack). Or I just don't play the game a lot (e.g. Incan Gold, R-Eco). There are some exceptions, e.g. I eventually got Ra (a gift), Modern Art. Should I feel obliged to buy a real copy of the game if I like it? Or if I like it enough to play it more than X number of times? Even when the home-made copy works just fine? Cost: In Malaysia, the cost to buy a game (well, at least the type of game that boardgame hobbyists buy) is not cheap to an average Malaysian. If I were an American or European making a living in US Dollars or in Euro, games would be much cheaper. Also I usually buy from overseas, because not all the games that I want to buy are available at local shops or local online shops. So shipping cost is a factor. Speed: Sometimes I just can't wait. E.g. Ra: the dice game. I can't wait for the next overseas bulk order that I make (usually only 2 or 3 times in a year). I can't wait for the local shop / online retailer to stock the game. Availability: Sometimes the local retailers do not stock the games I'm interested in. Sometimes I make games because they are out of print, e.g. when I made Ra in 2004, or Traumfabrik / Hollywood Blockbuster. Retheme: I self-made Traumfabrik using files downloaded from BoardGameGeek which use more modern-day (~1990's) movies and actors / actresses. I quite like that, and I have no interest in getting the Uberplay-published Hollywood Blockbuster which uses cartoonised / humourously tweaked movie, actor and actress names. I am also not interested in the original Traumfabrik with movies from around the 1930's, because I don't know the movies and celebrities from that era. Would a game designer to happy or upset to find that someone had self-made his game? Will he be happy or proud that a person has gone to such lengths to home-make his game? Or will he be unhappy that he is denied his reward in the form of another copy of his game sold? En Garde, designed by Reiner Knizia. 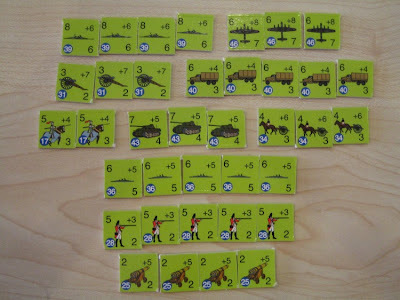 Knizia's games are often easy to self-make, because often the components are simple and can be made from generic pieces. En Garde is also a quick and clever game, even simpler than R-Eco. Unfortunately filler-like games in my collection always suffer the same fate of not getting played much. I guess if I had a bigger gaming group and frequent game sessions where people trickle in at slightly different times, then fillers would get played more. I will continue to self-make games. I realise that I'm doing this less and less though, probably because there aren't many games that are easy to self-make that I am interested in. There's no way I'm going to home-make a game like Race for the Galaxy with so many different cards. My tolerance for time spent on self-making a game is also less now. I can't imagine myself spending the kind of time and effort on self-making Ra (200+ tiles) and Traumfabrik now. Do you think self-making a game is right? Or when is it right and when is it wrong, if such a distinction can be made? 18 Sep 2009. We played a 4-player game of Byzantium. I have played this twice before, but only as 2-player games against Han. A 4-player game is quite tight. 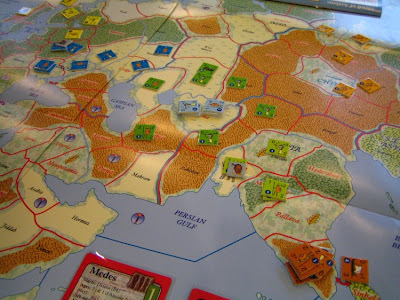 Much fewer opportunities for easy points, and we found that we often had to choose the civil war action, because otherwise we'd quickly run out of people to attack. Unfortunately I had an emergency and had to leave when still playing the first round (of three). 21 Sep 2009. 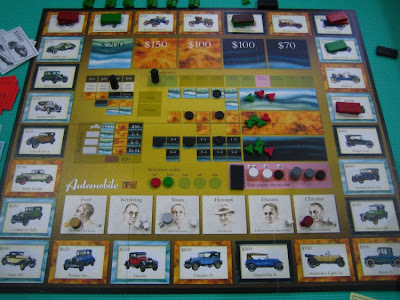 Another 2-player game (variant) of Automobile. Michelle tends to beat me at this game more often than not. Her explanation? "Howard" (the guy who helps you sell two cars). She won this game. 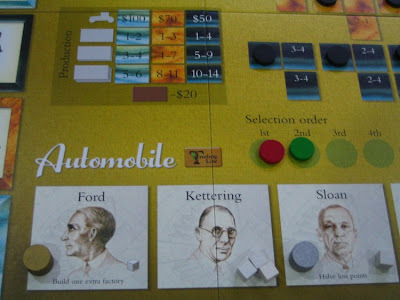 Three of the characters: Ford allows you to build an extra factory on a space where you already have factories, and you will be first in turn order if you choose him. Kettering gives 3 R&D cubes. Sloan halves your loss points. The other three characters, Howard, Durant and Chrysler. 22 Sep 2009. I taught Chong Sean Le Havre. I didn't know he hadn't played it before. Luckily I happened to have brought the game back to KK on that trip. He still felt the strategies weren't clear yet at the end of his first game. Indeed I think the large number of resource types and the buildings take a while to get familiar with. 23 Sep 2009. Scotland Yard. 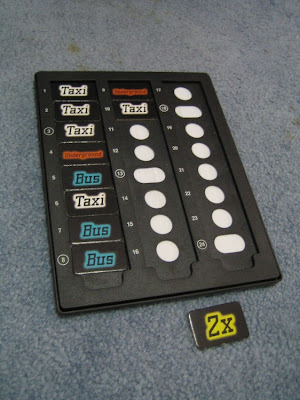 This is the board used by Mr. X to record his location secretly and to show the mode of transportation used. The wider spaces are where Mr. X must reveal his location to the detectives. Mr. X has two "2x" tokens which allow him to move twice, thus making it harder for the detectives to catch him. 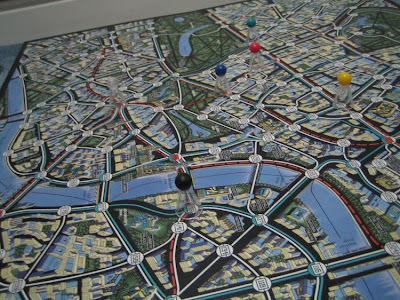 In this version of Scotland Yard, there are always 5 detectives in play, regardless of the number of players. I wanted to try being Mr. X, so Michelle played all 5 detectives. 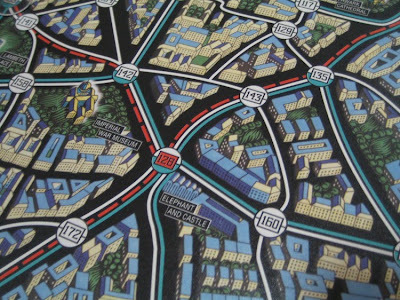 Location 128: Elephant and Castle. Michelle used to live near this place. In my previous game where I played as Mr. X, I did very poorly and got caught very early in the game. This time I had learnt my lesson and did much better, eventually winning the game. I had learnt that it is good to use taxis. You won't travel far, but because there are so many possible taxi routes, it is hard for the detectives to catch you, and you can slip through their closing web. The other thing I had learnt is you need to plan your move at least up to the next time you will need to reveal your location. You need to make sure once you reveal, you have many routes of escape. 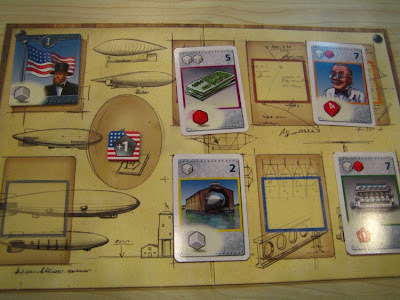 Airships is a dice game by Andreas Seyfarth, designer of Puerto Rico and Thurn & Taxis, both award winning games. In the past few years there seems to have been a burst of dice games being published. In many of them, you can roll dice multiple times, and each time you freeze a certain number of dice. This seems to be the most common mechanism for dice games. Airships is different - your only roll your dice once. The game moves faster and there is less waiting time between players. The game is about collecting tools to eventually help you build airships. 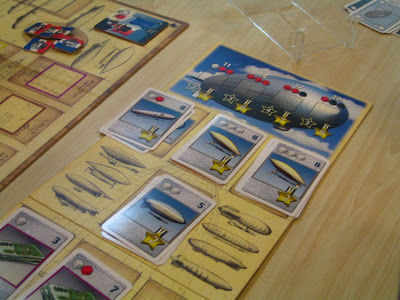 You score most of your points by building airships. Some tools also give points if you manage to acquire them. At the start of the game, you can roll two white dice on your turn. On the game board there are various tools (cards) available to be acquired. Each card tells you the requirements to acquire it, and the benefit it gives. Requirements are stated in the form of using a specific number of dice in a specific colour (or some specific combination of colours), and a target number. E.g. two white dice and one red die, to achieve 10. So if you want to target that tool, you must have the ability to roll at least two white dice and one red die. It would be better if you have the ability to roll more, because then after you roll the dice, you can pick the ones with higher numbers. The dice in the three different colours, white, red and black, have different number distributions. When you win a card, it gives a certain benefit, e.g. allowing you to roll an additional red die starting from your next turn, or allowing you to add 1 to a black die, or allowing you to roll two red dice in lieu of three white dice. There are 6 types of tools, and your player board can only accommodate one of each type, which means if you get a tool of a type which you already have, you must discard the old one. This makes things interesting. I found that I could never really build a perfect engine. There just aren't enough slots (or enough time) to build myself some invincible combination that allows me to roll 3 white, 3 red and 3 black dice. You are forced to make tough choices and to choose a path. Do you go for more red dice and fewer black ones? Do you go for a smaller number of each type of dice? Building an airship works the same way as acquiring a tool. The requirements are laid out in the same format. The reward is victory points, instead of new abilities. 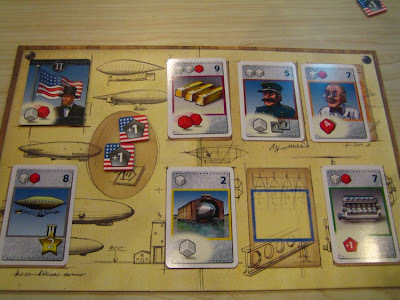 There are two ways that the game can end - either all four stacks of normal airships are depleted down to one card or less, or the all four stages of the Hindenburg, the largest of all airships, are built. This creates a twist in the end game, as different players may have different interests in how they want the game to end. The victory points for building stages of the Hindenburg vary depending on whether the Hindenburg is completed, so if you have spent effort on the Hindenburg, you'd want to make sure it gets completed. One thing that makes Airships quite different from many other dice games is you make the decision before you roll your dice. You don't roll, and then see what you get, and then decide how to use them or which ones to freeze or which ones to reroll. The key decision is which tool (or airship) to target for when your turn comes. You evaluate the risks and rewards before you roll your dice. There is also a long term strategy element in the game. You need to think of how far you want to improve your engine (dice rolling ability) before you start targeting the airships. You need to think of how to customise your engine. The game moves quickly and you don't have much time to fiddle around trying to fine-tune your engine. It's a race! My player board. My personal tile (top right) gives me one white die (this is the default for everyone). I already had 4 tools, which give me (a) one more red die, (b) one imaginary red die showing value 4, (c) one more white die, (d) the ability to add 1 to one red die. The central board is very long. At the top is the Hindenburg, which is built in 4 stage, followed by the four stacks of non-Hindenburg airships. The rest are the six types of tools (called expansions in game terms) available to players. The airships. Each stage of the Hindenburg has two numbers (hollow star and yellow star). The former is the points if the Hindenburg is not completed, the latter is for when the Hindenburg is completed. Later on in the game. 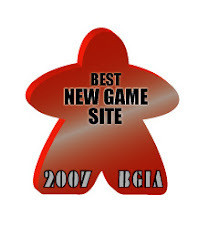 My player tile (top left) had been flipped to the advanced side, giving an additional red die. I had replaced my purple expansion with a different card. I had obtained a brown expansion giving me an additional white die, plus two "+1" tokens (one-time benefit). On the bottom left, I had acquired an airship card giving 2pts. Our 4-player game played quite quickly. Same four players who had just played 7 Ages for 7 hours, so Airships was a light closer for the day. Chong Sean was rather unlucky, and actually ended the game with 0pts! In Cantonese: 老猫烧须. Han won the game, the key being victory points from tools. We underestimated that. The rest of us only scored points from the airships themselves. Airships was better than I expected. I didn't expect much from a dice game, but it turned out to be different. There is more thought and more longer-term strategy to it than I had expected. Being a dice game, there is definitely luck in the die rolls (just ask Chong Sean), so sometimes even the best-laid plans can backfire. There are many meaningful decisions to be made throughout the game. Turns are quick (because you only roll once). I consider this one of the better dice games that I've played. 7 Ages is a civilisation game. It tells the story of the history of mankind, starting from the earliest ancient civilisations, to modern day nations. 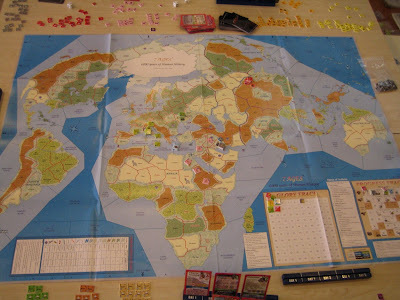 The game is played on a world map. 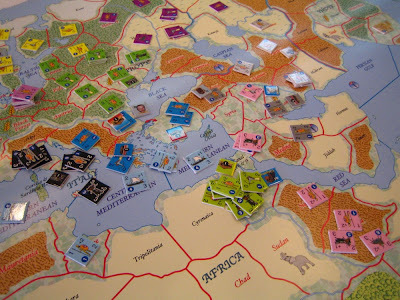 Each player controls a number of empires, settling new lands, conquering enemies' territories, building cities, constructing monuments, trading with other empires. You also get to play events, develop technologies, adopt religions, gain great leaders, build armies, fight battles, suffer disasters and so on. The scope of the game is truly epic. And it takes a bloody long time to play! Han, Chong Sean and I first played a learning game on 17 Sep 2009, playing about 1.5 ages in 2 hours. 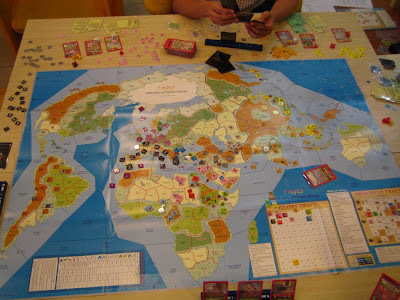 Then we scheduled another day to attempt to play a full, 7 ages, game, on 25 Sep 2009, this time with an additional player, Choo. To my surprise, we didn't even manage to play half a game. We only managed to play 3 ages in 7 hours. This may be partly because we didn't push our empires to progress as quickly as they could have done so. How does the game work? The two main things to talk about are the cards, and the action selection. The game comes with a big deck of cards, which serve multiple purposes. Each card shows an empire, which you can start as your own. The card tells you where this empire starts, how much money you get to buy your starting units, whether you have a capital, whether you get leaders, in which ages you can start the empire, etc. Each card also has a number ranging from 0 to 7, which is used for combat resolution, trading, some event resolution, and even in determining player order at the start of the game. Each card also has a technology, or religion, or artefact, or government, which one of your empires can develop / adopt / build. Each card also has an event that you can play on your own empire or someone else's. Some are good, some are bad. There are many ways to use a card, but you can only pick one. The cards in the game provide the bulk of the flavour. The cards are full of information. Most of the information is for the empire that you can start using the card. The red circles show the ways this empire can score points. 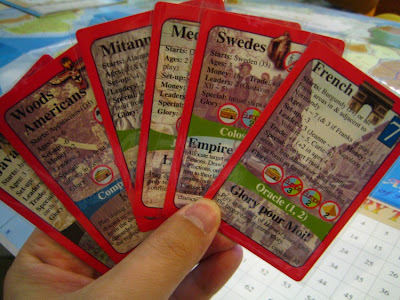 On the French card, the icons mean: (1) 1pt for holding your home territory (and -1pt for losing it), (2) 3pts for controlling the most land and sea territories outside of Europe compared to other European empires, (3) 2pts for controlling the most land and sea territories in Europe, and (4) 2pts for controlling the most artefacts. The number in the top right corner is used for many purposes, e.g. trading and battle resolution. The coloured bar (for this card) is an artefact. On other cards there are technologies, disasters, government forms, religions etc. And at the bottom is an event that you can play on your own or on others' empires. 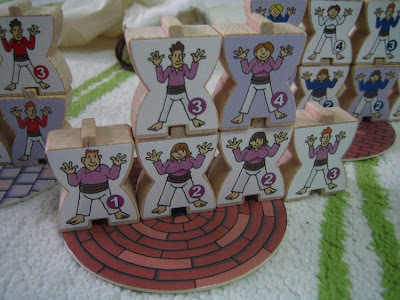 The structure of the game revolves around the action tokens. 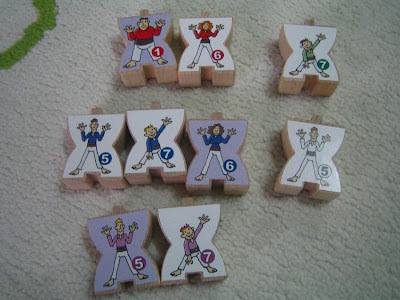 At the start of every round, every player secretly selects a number of action tokens. 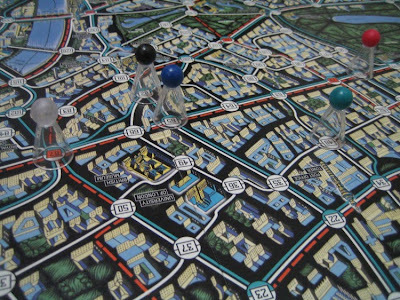 Then as each phase of a round is executed, players who have chosen the action token corresponding to that phase participates (in a way, this is like Race for the Galaxy). 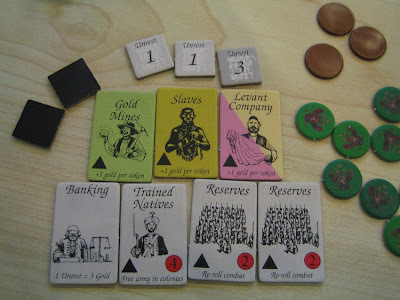 You can start a new empire, end an existing empire, discard/draw cards, move & fight, earn money & build units. You can trade cards and hopefully by "winning" (i.e. giving a better card to your trade partner) your empire gains some extra progress steps. You can choose an action called Civilise, which allow you to do many things - build cities, gain leaders, modernise your army, play event cards, found or adopt a religion, develop a technology, build a monument, etc. The tricky part of these actions is there is only one chip of each type of action. When you have multiple empires, they won't be able to do the same thing, since you can only assign one action chip to one empire. So you need to plan and coordinate. There is one Wild Card action chip that allow you to do one repeated action, but it costs one victory point, which is a big deal in this game. The scoring in the game is done every round. Every empire has a few ways to score, e.g. controlling the most land in Asia, retaining control of its home province, being the biggest Christian empire, having the largest navy, having the most colonies outside of Europe compared to other European empires. Sometimes you must be the top player to earn points. Sometimes you earn points for being in 2nd or 3rd place. Each empire has a few ways of earning points, but we found that typically you earn about 4 points for an empire for one round, and that's an empire that's doing well. Some empires earn only 1 or 2 points, and some may even cost you points! 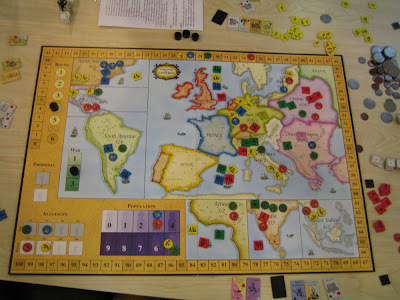 The way empires earn points is quite thematic and also interesting, and creates much variety. When you manage multiple empires, you should try to avoid conflicting interests among your own empires. You also need to watch your opponents' empires and try to prevent them from scoring, even if it means you need to do something that does not gain you points. 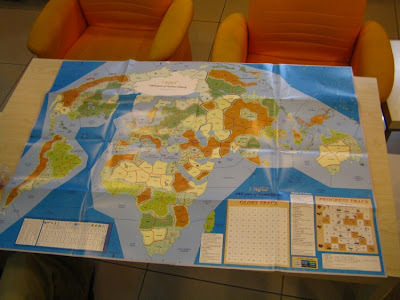 The game board (paper) is huge, and is made up of two sheets. Close-up of the board. This is where the two sheets overlap. 17 Sep 2009. This was our learning game. The Tamil empire (dark brown in this game) had just started at the tip of India. This was around the end of our learning game. We placed dice on our empire cards to indicate how many points each empire earned in the latest round. All the light green counters. Top left number: strength when fighting as a front-line unit. Top right number: strength when fighting as a support unit. Bottom left number: the time when the unit can appear. Bottom right number: movement speed. All the same counters, but turned over. One of the things you can do in the game is upgrade your unit, which means turning it over to the more advanced side. Of course your empire must have reached the required level of progress. There is a lot more to the game, and you'll really need to experience it to appreciate how rich the game is. Here are how our two games went. In our learning game, we did not plan to start in Age 1. The game allows players to start in any age, but somehow we started in Age 1 anyway. I forgot who started the first empire. 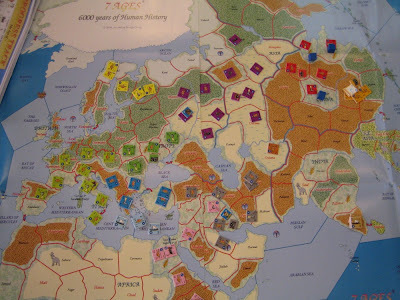 The first empire started determines the start age of the game. I don't remember much about our learning game, but one thing that was very funny (probably except to Han, who was the victim in that event) was how his Tamil empire was started and then immediately wiped out in the same round by a volcano eruption event played by Chong Sean. There is only one such event card in the whole deck, and Han happened to start an empire on the same round that Chong Sean had chosen to do a Civilise action (part of which allowed playing events). That was painful. We played and learned along the way, looking up the reference sheets and rulebook and player guide. There were quite many elements which I simply ignored and did not try to utilise, because there were simply too many things to think about and to read up. Even after having played 2 games, there are still many aspects of the game that I'm not familiar with yet. I just read and learn along the way, and if I find something (some leadership power, or some government, or religion, or artefact etc) useful, I try to incorporate it into one of my empires. 7 Ages is not a game you should try to know inside out before you start playing. For our second game, we made arrangements to meet up at 8am to start playing on a Friday. Some of us took leave from work to play. 8am is even earlier than a work day! We agreed to start in Age 1, so that we could experience the full scope of the game. The start of the game was quirky. Neither Han nor Chong Sean had any Age 1 empires in their starting hands. 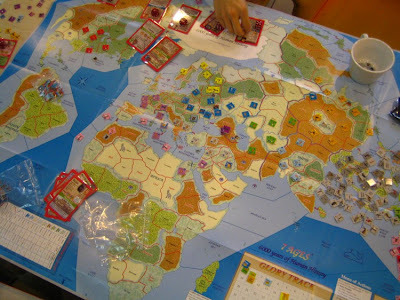 They were late by 2 to 3 rounds to start even their first empire, because they had to spend actions refreshing their hands trying to get Age 1 empires. Han was the last to start any empire, which was a big handicap. Choo, who played for the first time, had a very good start and played quite well. Drawing the Romans certainly didn't hurt, and he chose the intimidating black counters for the Romans. The quantity and quality of the units of the 15 colours in the game are not the same, and the black set is the strongest (but I think they are less in numbers). 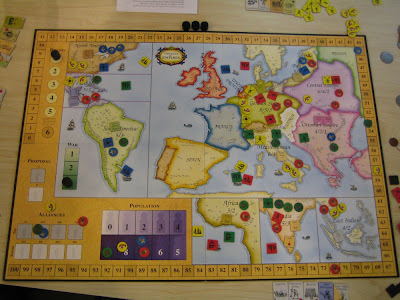 Competition in Europe and Asia (in this game, Asia is Middle East to Siberia, excluding China, India, and North East Asia) was fierce. Europe was very crowded. Asia had two aggressive empires - Chong Sean's Huns, which were mobile (normally empires are not allowed to vacate an occupied territory, thus reducing mobility and ability to attack others), and later Han's Mongols. Asia was not a safe place. The Middle East part of Asia was busy too. Choo had the Arabs and founded Islam there. There were a few North African empires. China saw a number of dynasties fighting one another. None of the dynasties were very lasting. The first two (I can't remember exactly - Shang and Xia maybe) fought bitterly. Later I started Tang, but it was quickly crippled when the Mongols appeared. I hurriedly ended the Tang empire. The glorious (in real life) Tang Dynasty only lasted as long as an ice-cream on a hot summer day. Later on Han started the Ming Dynasty, which did much better, and even started conquering Indian territory. The Tamil empire was the only one ever started in India. Coincidentally, exactly like in our previous learning game, Chong Sean had the volcano event and could have wiped out the Tamils just as they came out. What luck?! (Maybe I should say in the deep Darth Vader voice, "It is your DES-tiny") And I was the one who traded that card to him earlier. But he decided to be merciful and kept the card for another use. Surprisingly noone bothered the Tamils, and they spent quite some time expanding (even to South East Asia) and earning points for me. There was little activity in the Americas. I was the only one to have started an empire there, I think the Aztecs (or Incas?) in South America. They didn't have much victory point earning potential, and just gave me 2 points every round. Not much, but at least reliable. I barely developed this empire, so they continued to live in trees for a long time. Towards the end of Age 3, we started to see some colonisation-type empires. Chong Sean was first to have a European empire with a goal (and fulfilling it) of having the most non-European territories. We never progressed past Age 3. The concept of progress in 7 Ages has some similarity to Civilization. At the end of every round, every empire progresses one step for free, unless it is on a dark age space, or it has used the Wild Card action. If an empire is on a dark age space on the progress chart, it can only progress through trade, i.e. it must choose the Trade & Progress action and "win" the trade. By choosing Trade & Progress, an empire may progress up to 3 steps - one for "winning" the trade, one more if you are less advanced than your trade partner, and one for being the one to initiate the trade. 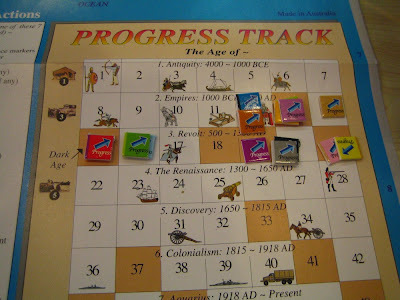 The last space of Age 3 on the progress chart is a dark age space, and for the last few rounds of our game, the two empires stuck on that space kept being stuck and did not manage to progress to Age 4 through trade. So we blamed Han and Choo for keeping everyone in the Dark Ages. They were the ones with empires on the brink of progressing to the next age. We agreed to play till 4:30pm, so we stopped then. Chong Sean had overtaken Choo and was the leading player by a comfortable margin. Chong Sean had earned some good points from artefacts and leader abilities. I was second place, with Choo close behind. Han was still in last place, despite having played aggressively and played well, due to his unlucky start and early game. So we've played less than half a game. And we've spent 7 hours, excluding lunch break. We gradually saw some changes in the nature of the empires. I expect the gameplay would gradually change as new empires came into play, and new units, new technologies, government forms, religions too. We had started seeing some improved horsed units, infantry and ships rendering the oldest units less effective. 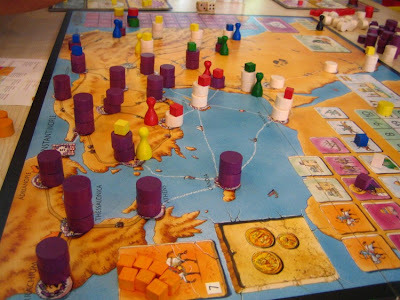 The later empires would also score higher per round. There was still so much more to experience and to explore. If I get a chance to play 7 Ages again I would grab it, and I wouldn't hesitate to try to complete a full game. 25 Sep 2009. Early in our 4-player, 7-hour, 3-age game. Some empires around the Mediterranean, and one in China. Choo was red/pink (and later grey too). I was light/dark green. Chong Sean was light/dark blue (and later dark purple too). Han was yellow/orange. 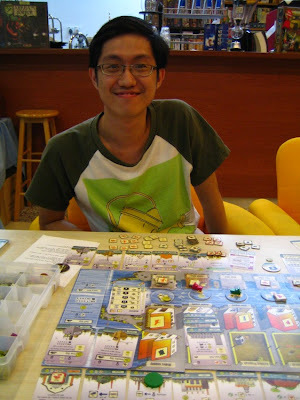 Chong Sean's dark and light blue empires were both in Greece. My light green empire was the Etruscans, who were soon wiped out by the Romans (Choo's) who appeared not long after this. 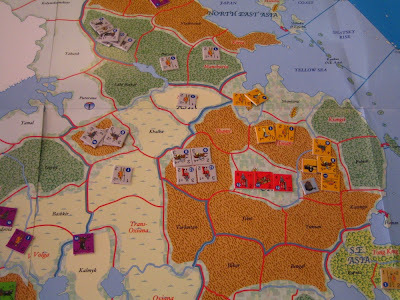 Purple was Chong Sean's nomadic Huns empire, which earns points by destroying cities. I thought my dark green Central European empire would be doomed, but surprisingly it lasted quite long and earned me some decent points. Han's yellow Scandinavian empire did little good for him. His orange Chinese empire competed with Choo's red empire. Choo's red empire was so rich that it had nothing better to do than to keep building forts (which we used blue cubes from another game Age of Mythology to represent). 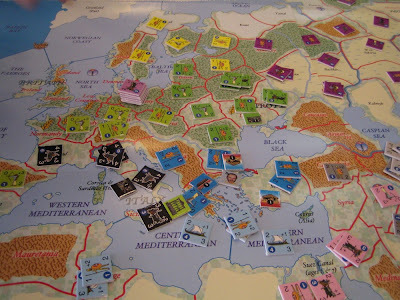 Rome (black, played by Choo), was gradually wiping out the Etruscans (light green). They had even built a world wonder (the structure on a light green background, at Sicily). Chong Sean's dark blue empire had built a number of cities. He also had a leader (a face on a light blue background). Chong Sean also just started his light purple empire in Germany (that stack). My South American empire, the only one in the Americas throughout our whole game. Strife in ancient China. Choo's (red) and Han's (orange) dynasties fighting it out. 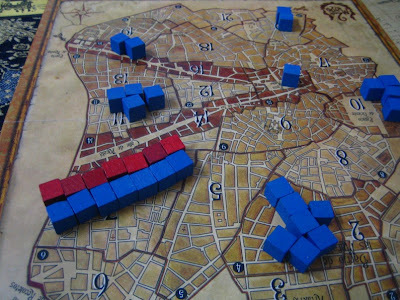 We used red blocks from Age of Mythology to represent unrest. These were played on Choo by Han. Europe, the Mediterranean, and the Middle East were rather crowded. 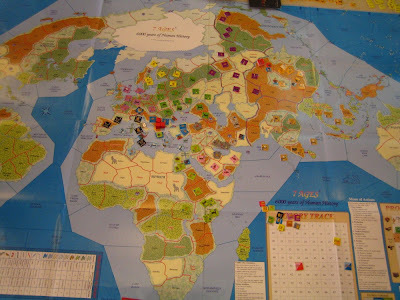 Han (using the light green counters) had just founded the Egyptian empire, having Cleopatra as his leader. We played one rule wrong. The two start colours of a player can never be used by any other player. Light green was one of my start colours, but my empire using this colour had ended. We discovered our mistake only halfway through thet game, so we agreed to continue playing with this mistake for this game. Egypt had spread to much of the Nile banks. The Tamil empire had spread to Indochina. I had just started another Chinese empire (Tang Dynasty), also using red (the same colour used by Choo's earliest Chinese dynasty). The Tang Dynasty was crippled by the (grey) Mongols, losing even their capital. Han had a lot of monuments built in Eastern Africa. His Ming Dynasty (yellow) had just started in China. His (grey) Mongols were attacking into India. Chong Sean's British (dark purple) had just emerged. The Progress Track. Brown spaces are dark ages. You must performing trading to progress past these spaces. The pictures of units mean once you reach these steps, you can start training these units. The city sizes on the left correspond to the ages in which you can build cities of such sizes. End of our game. My South American empire finally grew to a good size, but still only gave me 2 points per round. The Ming (yellow) was rising and threatening the Tamils (light brown) with advanced ships. The Romans (black) were still hanging around. The British (dark purple) had colonised Greenland. The players, proud of their achievement of having played a 7-hour game: Choo, Han, Chong Sean. 7 Ages is enjoyable. It is also very long. Being long is not bad in itself, but I do find it a little tedious. I wonder whether there is some way to simplify or streamline it. Maybe simplying the combat system or the units themselves. The game covers very many aspects of civilisation building, but it seems that a lot of the emphasis is in fighting, which is a shame. I'm not sure whether this is because of the way we played. Other groups may have different experiences. Many of the scoring conditions are related to controlling territories, so it seems you can't really run away from fighting over territory. This is definitely a daunting game. I joked with Han that it's reference sheets have more pages than many Eurogame rules. Han printed out a player guide / player aid prepared by a fan of the game, it was practically a thick book! So this is definitely a gamer's game. In a way, this is also an experience game. Sometimes you really can be screwed by bad luck. Sometimes you get hit by bad events. You watch your empires rise and fall. 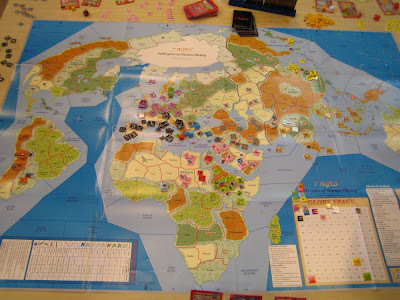 But I would say you still make many decisions and take an active role in steering your empires. There is an element of diplomacy in the game. If there is an obvious runaway leader, other players can and should cooperate to keep him in check. In this way, some luck is balanced out. One last point about 7 Ages - come to think of it, this is actually a very educational game! Well, maybe except the part that Jesus Christ is one of the leaders you can choose to lead your Roman empire. I bought Struggle of Empires in 2004, in Taiwan. This was my first time playing it (almost 5 years), and it was not even my copy. But I'm happy that I finally got to try it. This is a multiplayer conflict game, so it needs more players to be good. And it needs players who don't mind some conflict. I seldom have this combination, thus why the game has been unplayed for so long. We played a 4-player game - Han, Shankaran, Chong Sean and I. I'd like to play it with 5 or more (the game supports 3 to 7 players), but it turns out that 4P is quite fun too. The backdrop of Struggle of Empires is the age of colonialism. 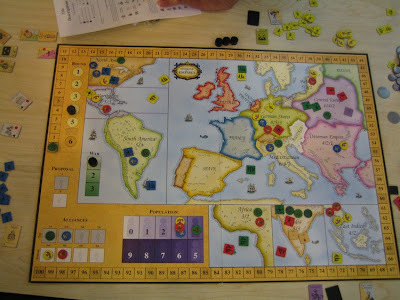 Players are European countries competing to exert influence on other minor European powers or on distant colonies. 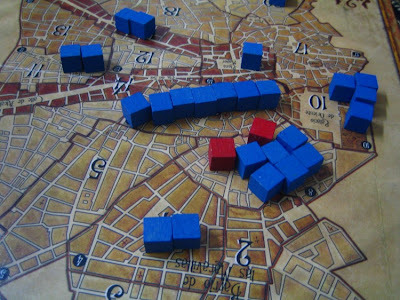 The game is very much an area majority game. Each of the 11 regions where you can exert influence awards points to the countries having the most influence in the region. There are many ways to exert influence, population migration and shipping slaves, but most of the time, you need to fight - either the local powers, or other foreign powers. So, you build troops (navies, armies or forts), you move troops, and you fight. So far, it still sounds a little bland. Where a lot of flavour comes in is the tiles. The game comes with a LOT of tiles, which provide special abilities. Some have one-time effects, some have ongoing effects. Some have very quirky effects. They add a lot of character to the game. What kind of country do you want to run? Which tiles would benefit you the most? There is a random set-up at the start of every game, which makes things variable. Each country will have some influence already established in some regions. At the start of each of the three wars that make up the game, there will be 10 tokens placed randomly. These are opportunities for the players to exert influence on the regions. So there is quite some variability in the game. How scoring is done is a little unusual compared to other area majority games. Each region has 2 or 3 numbers, e.g. Central Europe is 6/4/2. The players with the most influence all get 6pts. The players with the next most influence all get 4pts. In the case of ties, everyone gets awarded the same higher score. So you just want to be one of the players with the most influence. There is less incentive to reduce the influence of other players. Gaining more points for yourself seems to be a more efficient use of your actions than trying to make others earn less points. This scoring system also seems to encourage players to have some influence in many regions, rather than having heavy influence in a few regions. Combat resolution reminds me a little of Perikles. There is a navy support phase followed by the main combat. It is quite straight-forward. It uses dice, so there is some luck. Not as much as Risk, but still you need to be prepared for some bad luck to strike. Your basic strength come from your units and the effect of your tiles. Then you add the result of rolling two dice and taking the difference (i.e. die roll result ranges from 0 to 5). Money is tight. It is mainly used for fighting battles ($2 each). War is expensive. There is a concept of unrest. Every time you are short of money you can take $2 from the bank at the cost of 1 unrest point. Every time a unit dies you take 1 unrest point. At game end, you lost immediately if you have too much unrest. You also lost points for having the most or second most unrest. So you need to be careful about unrest. One interesting part of the game is the alliance system. 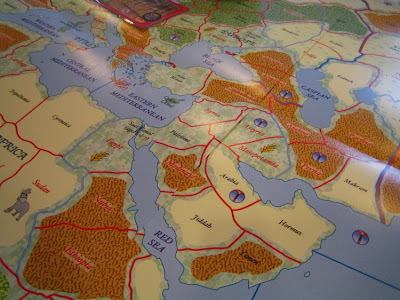 For each of the 3 wars that make up the game, you go through an auction process to set up two alliances. Players in the same alliances are not allowed to fight each other. So if you want to attack a person, you need to make sure he's in the enemy alliance. If you want to prevent another player from attacking you, try to force him into the same alliance as you. The many tiles that are available in the game. And these are not all. At this point some of the tiles had already been claimed by some of us. The coloured (i.e. non light grey and non dark grey) tiles are region specific. Some provide extra income if you have influence markers in those regions. Some provide extra strength when you fight in those regions. Top row: armies, navies, a fort, $1 coins, control markers. Bottom row: tiles. The black triangle icon means you can use this tile once per war. The number in the red circle is the cost you have to pay when you claim the tile. Alliance tiles (with an A in a white circle) are effective only for the current war an must be returned to the general supply at the end of the current war. Unrest tokens (at the top) should be hidden from other players. 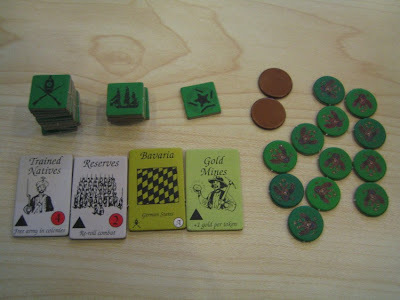 In our game we liked to take the Reserves tile, which allows you to reroll all dice during a battle. I found it quite useful. In our game, as expected, most of us started off attacking the neutral tokens, before attacking one another. We also tried to grab as many useful tiles as possible early in the game, so that we could benefit more from them. Chong Sean took a Euro-efficiency-peaceful approach, exerting influence as widely as possible at the most lucrative areas, while minimising conflict. Han took a more aggressive approach. Shankaran and I were probably somewhere in between, but maybe tending more towards the war-mongering side. 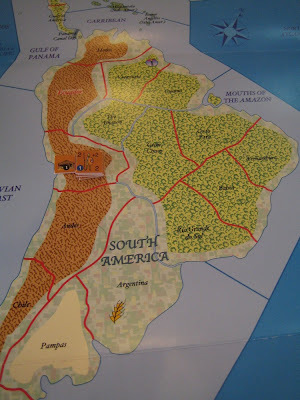 Most of our fighting took place in Europe, some in North and Central America. Other colonies were quite peaceful. The Ottoman Empire was pretty much left alone throughout the game. No one wanted to fight the locals (i.e. the square tokens) who were strong, and they also cost you an unrest point. By the end of the 2nd war, Chong Sean was the clear leader, followed by Han. So during the alliance phase of the 3rd and last war, we (i.e. the rest of the losers) conspired to place Chong Sean in a difference alliance from Han (2nd place) and I (3rd place), so that both of us could attack him. We did so mercilessly, even though Chong Sean has been a nice guy. He lost much influence in the 3rd war. At the start of the 3rd war, Shankaran and I started taking Reform tiles to help us get rid of unrest points. These are the only way to get rid of unrest. Chong Sean and Han didn't do this as much, and by game end they had the most and 2nd most unrest, costing them 7pts and 4pts respectively. However this penalty didn't cause any change in position. Chong Sean won the game, albeit with a smaller margin. Our scores were close. 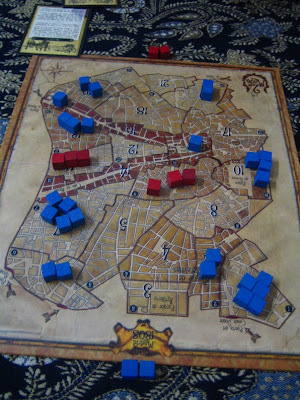 The game board. This was in the middle of the first war. The alliance table is at the bottom left. 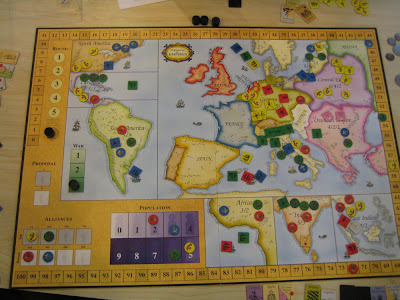 In this war, I (green/Russia) was the start player, followed by Han (yellow/Spain), then Shankaran (blue/France), then Chong Sean (red/Britain). Shankaran (blue) and I (green) were in the same alliance, and Han (yellow) and Chong Sean (red) in the other. Middle of the second war. Same alliances, just minor change in turn order. Things were heating up at the German States, Mediterranean (Italy) and Baltic states. Start of the third war, just after the 10 random square tokens were drawn and placed, and before we started the auction for alliances. At this stage both Shankaran (blue) and I (green) have been kicked out of the German States and Central Europe. End of the third war, before scoring was done. Han (yellow) had greatly reduced Chong Sean's (red) influence in Central Europe and the German States, however it wasn't enough to keep Chong Sean from winning. 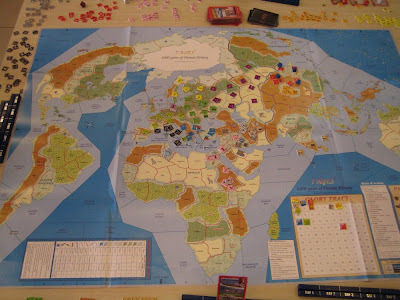 Struggle of Empires feels more like a wargame to me than an area majority game, because there is a lot of fighting you need to do. 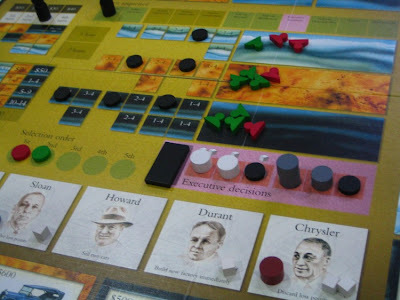 Mechanic-wise it probably should be considered an area majority game, since most of the scoring revolves around establishing influence in the 11 regions. Maybe the theme left more of an impression on me than the mechanics, which I think is a good thing. I was pleasantly surprised that the game plays quite well even with only 4 players. I was initially worried there may not be enough competition. The number of tiles, and their special abilities are quite daunting. You have much freedom to shape your strategy. But this is definitely not a game for casual players. I think I probably spent as much time trying to explain the tiles as explaining the rest of the rules. I imagine this would be a turn-off for non-gamers. Also this is not a game for those who don't like conflict in their games. In Struggle of Empires, you will fight. I enjoyed the game, and I'm keen to find out how it plays with the full complement of 7 players. Ooh... that's going to be brutal.